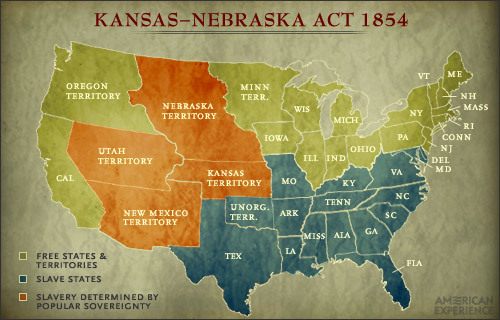 The Kansas-Nebraska Act was passed by the U.S. Congress on May 30, 1854. It allowed people in the territories of Kansas and Nebraska to decide for themselves whether or not to allow slavery within their borders. This is called “Popular Sovereignty”. The Act served to repeal the Missouri Compromise of 1820 which prohibited slavery north of latitude 36°30´. The Kansas-Nebraska Act infuriated many in the North who considered the Missouri Compromise to be a long-standing binding agreement. In the pro-slavery South it was strongly supported. 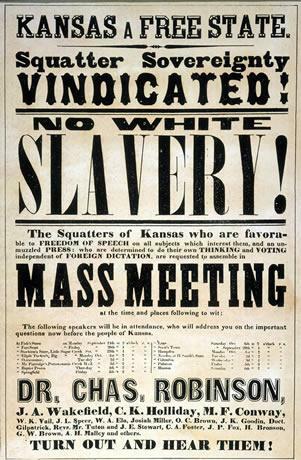 After the Kansas-Nebraska Act was passed, pro-slavery and anti-slavery supporters rushed in to settle Kansas to affect the outcome of the first election held there after the law went into effect. Violence soon erupted, with the anti-slavery forces led by John Brown. The territory earned the nickname “bleeding Kansas” as the death toll rose. When was the Kansas/Nebraska Act passed? How was it going to be decided if Kansas/Nebraska were going to be slave or free? What compromise was repealed because of the Kansas/Nebraska Act? Who supported the Kansas/Nebraska Act, the North or South? True or False? Kansas and Nebraska were both above the 36 30 line. In January 1854, Senator Stephen A. Douglas of Illinois proposed a bill to organize Nebraska (part of the Louisiana Purchase) as a territory, in order to facilitate the building of a transcontinental railroad along a northern route from Chicago to the West. Because the Nebraska Territory lay above the 36º30′ line, set by the Missouri Compromise to disallow slavery, Nebraska would automatically become a candidate for admission as a free state. Southerners therefore planned to oppose the bill unless Douglas made some concessions. To ensure passage of the bill, Douglas yielded to Southerners who desired to void the Missouri Compromise’s 36º30′ line. He inserted in his Nebraska bill an explicit repeal of the Missouri Compromise so that no territory would be automatically designated non-slaveholding. As an alternative, the bill declared that the slavery issue in the Nebraska region would be decided by popular sovereignty, thus extending the Compromise of 1850’s concept of popular sovereignty to territories outside New Mexico and Utah. Douglas further divided the Nebraska Territory into two parts: Nebraska to the west of Iowa, and Kansas to the west of Missouri. Many assumed that this meant Kansas would be reserved for slavery and Nebraska for free soil. With these concessions attached, the bill passed through Congress and became law in May 1854. The Kansas-Nebraska Act effectively nullified the Missouri Compromise and opened up the Nebraska and Kansas territories to popular sovereignty. The Kansas-Nebraska Act, however, did not stave off sectional conflict. Because Nebraska was likely to prohibit slavery, as a territory above the 36º30′ line, Kansas became a battleground for Northerners and Southerners. Both Northern abolitionist groups and Southern interests rushed into the territory to try to control the local elections. In March 1855, during the first election of the territorial legislature, thousands of pro-slavery inhabitants of Western Missouri crossed into Kansas to tilt the vote in favor of slaveholding interests. Because of the election fraud perpetrated by these “border ruffians,” a pro-slavery government swept into power. This new government immediately ousted antislavery legislators and set up a pro-slavery constitution known as the Lecompton Constitution. As the two sides argued back and forth, the violence got worse. There had been several attacks during this time, primarily of proslavery against Free State men. People were tarred and feathered, kidnapped, killed. But now the violence escalated. On May 21, 1856, a group of proslavery men entered Lawrence, where they burned the Free State Hotel, destroyed two printing presses, and ransacked homes and stores. In retaliation, the fiery abolitionist John Brown led a group of men on an attack at Pottawatomie Creek. The group, which included four of Brown’s sons, dragged five proslavery men from their homes and hacked them to death. Kansas became known as Bleeding Kansas. John Brown was born at Torrington, Connecticut, on 9th May, 1800. The family moved to Ohio in 1805 where his father worked as a tanner. John’s father was staunchly anti-slavery and was a voluntary agent for the Underground Railroad. Over time, Brown developed strong opinions about the evils of slavery and gradually became convinced that it would be necessary to use force to overthrow this system. After the passage of the Fugitive Slave Law in 1850, Brown recruited forty-four men into the United States League of Gileadites, an organization founded to resist slave-catchers. In 1855 Brown and five of his sons moved to Kansas Territory to help anti-slavery forces obtain control of this region. His home in Osawatomie was burned in 1856 and one of his sons was killed. With the support of Gerrit Smith, Samuel G. Howe, and other prominent Abolitionists, Brown moved to Virginia where he established a refuge for runaway slaves. In 1859 he led a party of 21 men in a successful attack on the federal armory where weapons were stored, at Harper’s Ferry. Brown hoped that his action would encourage slaves to join his rebellion, enabling him to form an emancipation army. Two days later the armory was stormed by Robert E. Lee and a company of marines. Brown and six men barricaded themselves in an engine-house, and continued to fight until Brown was seriously wounded and two of his sons had been killed. John Brown was tried and convicted of insurrection, treason and murder. He was executed on 2nd December, 1859. Six other men involved in the raid were also hanged. 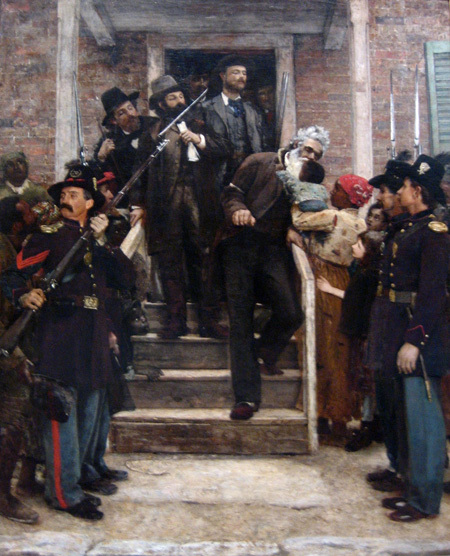 The song, John Brown’s Body, commemorating the Harper’s Ferry raid, was a highly popular marching song with Republican soldiers during the American Civil War. John Brown’s statements during his trial reached the nation, inspiring many with his righteous indignation toward slavery. The raid ultimately hastened the advent of the Civil War. The Harpers Ferry raid confirmed for many Southerners the existence of a widespread Northern plot against slavery. In fact, Brown had raised funds for his raid from Northern abolitionists. To arm the slaves, he ordered one thousand pikes from a Connecticut manufactory. Letters to Governor Wise betrayed the mixed feelings people held for Brown. For some, he was simply insane and should not be hanged. For others, he was a martyr to the cause of abolition, and his quick trial and execution reflected the fear and arrogance of Virginia’s slave-owners. Many Northerners condemned Brown’s actions but thought him right in his conviction that slavery had to end. Brown’s raid on Harpers Ferry and his execution further polarized North and South and made a resolution of the slavery issue the center of national debate. Why did Stephen Douglass want to organize the Nebraska territory? Why would Nebraska automatically become a free state? Based upon context clues and what you know, what is the best meaning for the word concessions.? What did Douglass have to do in order to get the bill passed? When the Kansas/Nebraska act was passed, what did pro and anti slavery people start doing? Which side gained power of Kansas first? Pro slavery or anti slavery? Give an example of some of the violence that erupted because of the Kansas Nebraska act. What did John Brown do in Kansas? Who in John Brown’s life was an example of an Abolitionist? What did Brown think that his attack would help him form? Do you think the attack was ultimately successful or unsuccessful? What was John Brown’s fate? What were the effects of John Brown’s raid? 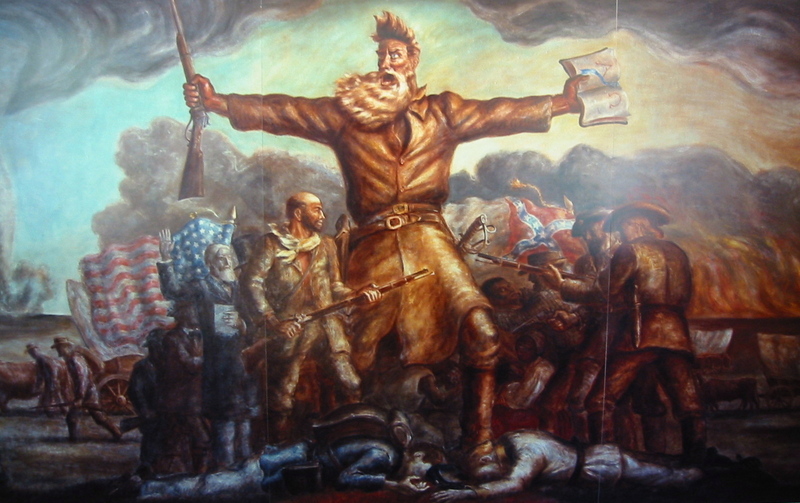 Many in the north supported John Brown’s actions, while those in the south thought he was wrong.